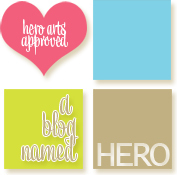 It's been great seeing all these rainbow designs on A Blog Named Hero's Rainbow challenge this month! This has inspired me to get out all my inks to make my cards! The one today is for a couple who just had a second baby, another boy! I used the Ranger Dye Inks and the Hero Arts Large Vintage Alphabet stamp set to make the name. I then masked this and worked on the rainbow background using several distress inks and then spraying with some Perfect Pearls. The shimmer on the card is just great! I left it very simple with a bit of sentiment and a little monkey from Mama Elephant as the baby was born in the Year of the Monkey in the Chinese Lunar calendar! I'm also adding this card to Simon Says Stamp Wednesday challenge - Cute and Cuddly. Thanks for dropping by! what a wonderful personal card for your friends - i'm sure they will treasure it - and also a wonderful card for ABNH challenge - thanks for joining and good luck. 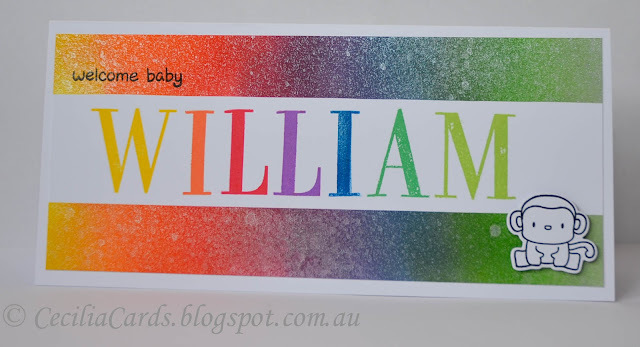 I am a huge fan of personalized cards, and paired with a rainbow? Doesn't get any better that than for the little bundle of joy at the end of the parents' rainbow. Gorgeous card Cecilia! I love how you've personalized the card and the rainbow background you've created looks wonderful.